Preliminary design plan prepared for the Navy Department during consideration of a design for a troop transport to be included in the Fiscal Year 1917 program. 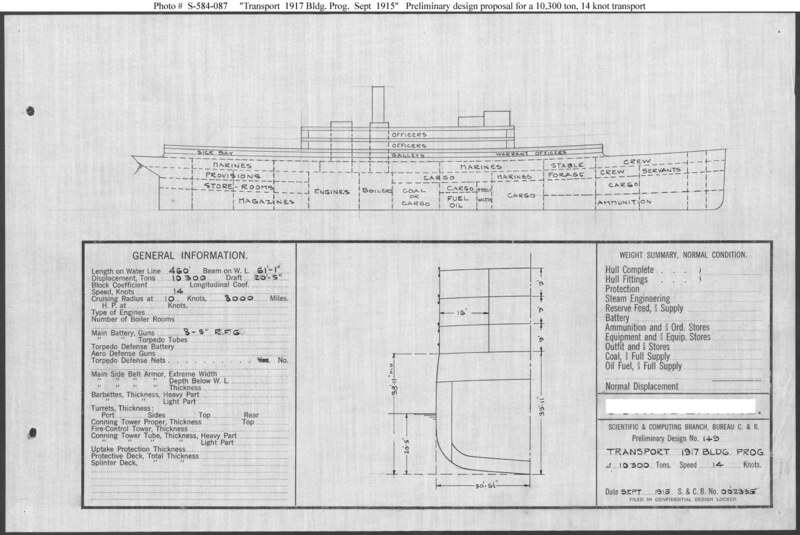 This design was similar to that adopted for the Navy’s first troop transport of this era, Henderson (Transport # 1) of Fiscal Year 1913 (see Photo # S-584-074), but differs in having a longer enclosed superstructure at the main deck level, housing personnel quarters and a large sick bay. No purpose-built transports were authorized in Fiscal Year 1917. Another earlier transport (Transport # 2), authorized in Fiscal Year 1916 and appropriated for construction in Fiscal Year 1918, was never built. This plan provides eight 5-inch guns, steam machinery and a speed of 14 knots in a ship 460 feet long on the water line, 61 feet 1 inch in beam, with a displacement of 10,300 tons.